Consider the typical clinical environment with medical staff on different shifts and in different disciplines. How can you build a good feedback methodology for all of those different front-line providers, clinicians, and support staff? My approach is one I call “The Rocket, the Reuben, and the Rubberband;” three metaphors for three clinical communications avenues to explain effective feedback and improve any implementation. The early stages of a rocket launch are often the most critical. Information from computers and gyros and data systems is constantly being reviewed and early decisions are being made about the long-term trajectory even before it has enough momentum and airspeed to keep it on course. The rocket needs constant feedback right from the beginning, just like your implementation. Open the communication stream early to avoid errors in trajectory down the line. As I explain in a Doctor’s Hours video, the phrase that pays is “constructive feedback,” and the best way to ensure constructive feedback is to develop a culture in which all staff feel encouraged and engaged. As you develop a positive feedback loop, individuals experience a team-belonging and communication becomes more enlightened and effective. Some good guidelines for how to evaluate or audit your communications strategies come from a method called “SWIM,” which I’ve modified from an Advisory Board model. The first measure is Scale, meaning whether a technology or method is scalable to reach the entire medical staff or a small group of stakeholders. Email is certainly the most scalable of all — with one click hundreds or thousands of people are reachable. But email may not be the best method; sometimes a phone call or in-person meeting will be more appropriate. Use scale, both big and small, to communicate with the correct audience. Next is a basic question: What? This is the measure of what the benefit will be to doctors and nurses in your practice, as in, “What’s in it for me?” It’s also a consideration of what information is important to deliver and decide upon. A communication strategy is not just an announcement, it's an engagement. The Impact of each communication is equally important. If your scale is correct and the engagement is important to the recipient then ask, “how will the communication be impactful to the eye, the ears, and the mind?” I want the audience to stop and ponder and think. How will they pick my communication out of a hundred others and give the implementation the time it needs for thoughtful feedback? And the fourth measure, Meaning, refers to whether your communication strategy provides a meaningful experience for your staff, and allows them to give constructive feedback. Communication is not really one-way, it is a back-and-forth, a conversation about how to move forward. Meaningful communication is often missing in large institutions and large implementations. Let your communications be meaningful. It will pay huge dividends for your team and your organization. To spur meaningful conversation, you can certainly start with newsletters, emails, posters, and signage to remind your staff of upcoming trainings and opportunities to share their ideas and opinions. But, remember to follow-up those initial ‘announcement-style’ strategies with phone calls, sit-downs, and town hall meetings. Give people a voice during clinical implementation and, while they may deliver both great answers and worrisome concerns, they will always feel they were heard. And that’s why the analogy of a rocket is helpful to consider: Effective communication means that your rocket, your implementation, will stay on target and reach its destination via constant feedback from your very best source of truth, your physician staff. Our solutions support the active exchange of EHR data across care settings of all sizes, improving patient care and providing a foundation for your population health strategy. 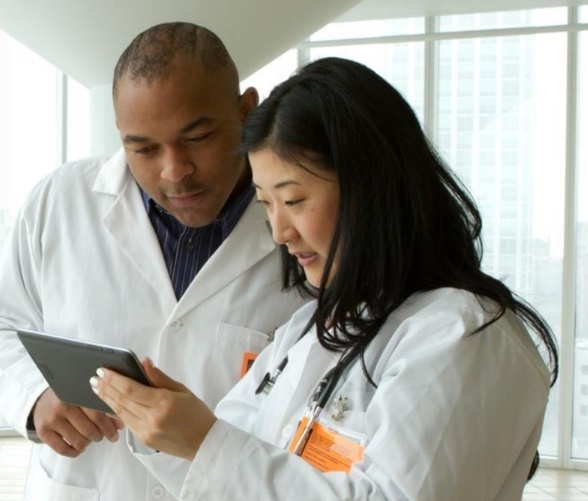 Read more about how our solutions support interoperable care. So, what do a reuben and a rubberband have to do with effective communications strategies for your EHR implementation? Watch this 45-minute video about The Rocket, the Reuben, and the Rubberband on MEDITECH’s Doctors’ Hours podcast page, and download the PDF of the accompanying presentation to get the answers.